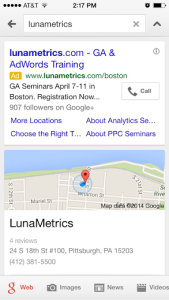 It’s no secret that we love Ad Extensions at LunaMetrics. Ad Extensions are the best way to enhance paid results on Google.com and provide searchers with the opportunity to dive further into your site, or, directly contact your business. Advertisers have a myriad of Ad Extension options and today, I’m going to make a strong case for you to test one of the most popular features, Call Extensions. You might be thinking, “This song is so 2011, why did she do this?” I tend to agree based on the fact that I cringe every time this song plays. The key part of this image, however, is the word “Maybe.” Before explaining the benefits of Call Extensions, I urge you to think about how much value your business places on phone calls. For example, on a kickoff call last week, we asked our client how much they value phone calls. Their response? “Not much. Calls aren’t important to us.” Call Extensions aren’t for everybody and you need to make that decision before moving forward. On the flip side, during a different client meeting, I proposed Call Extensions as a strategy to enhance ads knowing that they are a university and prospective students frequently call and inquire about program offerings. This client doesn’t have a CRM system, so after explaining tracking options, they jumped at the chance and we’ve seen success since launch. 1.) What Do Call Extensions Look Like? 2.) How Do I Implement Call Extensions? Now, you need to decide whether you want to use a Google forwarding phone number or My own phone number. 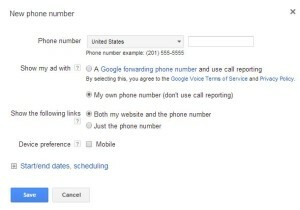 By selecting a Google number, you have access to call reporting that includes: start & end date/time, status (missed or received), duration, caller area code, campaign, ad group and call type (manually dialed vs. mobile click-to-call). This is a randomly-generated phone number that will forward to your phone line. Additionally, you can count phone calls as conversions when they last longer than a period of time defined by you. The ability to count phone calls conversions disappears. Additionally, by not using a Google-forwarded number, the reporting features outlined above are not available. Despite the differences in how you choose to display phone numbers, one of my favorite features about Call Extensions is scheduling . That’s right – if nobody can answer the phone, you can schedule your phone number to go dark. 3.) How Do I Report on Call Extensions? After implementation, pull a Call Details report to gauge how many phone calls you received, and area code in which they came from and whether or not that phone call led to a conversion. You can even customize columns to analyze the Campaign and Ad Group source. 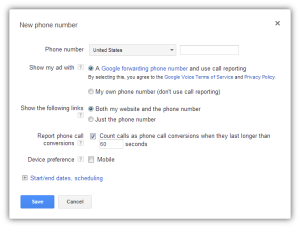 Follow this path in the AdWords UI for reporting: All Online Campaigns > Dimensions > View: Call Details. As I mentioned earlier, we launched Call Extensions for a client last Thursday afternoon, only running Monday – Friday from 9:00 AM – 5:00 PM EST. In less than four business days, we’ve received 13 calls with the majority lasting longer than 30 seconds. 4.) Should I Implement Call Extensions? 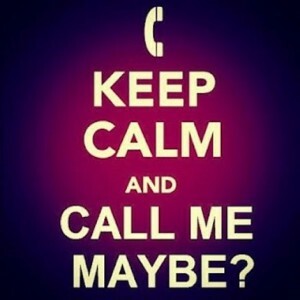 If phone calls are important to you, call me, definitely. Have you already seen success with Call Extensions? Have questions about implementation? Let us know!